Lexicon's Ionix range trades Firewire for USB and moves from the rack to the desktop. I reviewed the flagship of Lexicon's Ionix range of audio/MIDI interfaces back in the June 2009 issue of SOS, and was impressed by both Dbx's contributions (preamp, Type IV conversion and DSP channel strips) and Lexicon's bundled Pantheon II reverb. The remainder of the Ionix range consists of three further audio/MIDI interfaces, the angled desktop housings of which are designed to sit snugly between your computer's keyboard and monitor. I tested the largest of them, the eight‑input U82S, and you can read its main specs in the Vital Statistics box. The similarly styled U42S and U22 cut the input count to four and two respectively, and the latter also drops one instrument input, one headphone output, and the S/PDIF I/O. All three interfaces benefit from the same, pretty decent, bundled software package, which comprises the aforementioned Pantheon II reverb plug‑in, Steinberg's Cubase LE4 and Toontrack's EZ Drummer Lite. The hardware of the U82S is solidly built and immediately inspires a feeling of confidence in its robustness. I'm not normally too much of a sucker for cosmetics, but I have to say that this thing looks pretty natty parked tidily on its non‑slip rubber feet under my screen. I also found the positioning of the sockets and controls, for the most part, very well thought out, and although I was initially concerned at the placement of the rear‑panel phantom‑power switches, the spacing of the combi‑jack/XLR sockets is wide enough that only those with hands like bunches of bananas are likely to find access in any way restricted. Visual feedback is also pretty good, with decent LED metering and further sensible use of LEDs for status indication. One down side of the sleek look is that the pointers on the rotary controls aren't tremendously easy to see, and if I were to buy one of these units I'd almost certainly set about it with a Sharpie, sharpish, to draw clearer indicator lines. The rear panel is where we find almost all of the Ionix's connections, the exception being the two instrument inputs and a pair of headphone sockets, which are found at the sides of the unit.The preamps are of a very similar design to those in the FW810S, and as such are clean, quiet, and quite neutral, which means that they'll cope with the gamut of project‑studio recording tasks confidently. As on the flagship, though, the gain range is fairly ordinary, so some ribbon mics may pose a challenge, and the gain is also bunched a little towards the upper end of the control, especially the last 6dB or so. 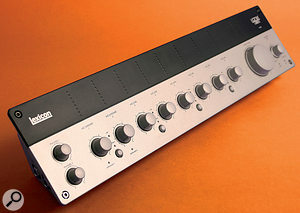 Although the conversion doesn't feature Dbx's Type IV peak‑protection system, as the FW810S does, the quality nonetheless seemed fine to me, and headroom is less of a concern with modern 24‑bit interfaces than it used to be in the days of 16‑bit. The onboard monitoring system works by feeding a mix of the interface's inputs directly to its outputs in the analogue domain, so in other words it's a true zero‑latency design. By default, all the monitoring signals arrive at the outputs in mono, but if you hit the Stereo button on any channel pair, the odd‑numbered input will feed the left output and the even‑numbered input the right output, thereby accommodating appropriate monitoring of stereo microphone arrays and the like. This system can be made to work pretty well, and the only real limitation is that there's no way to set an input's direct monitoring level independently of its preamp gain. If you pull down an instrument's gain control for monitoring purposes, you'll also reduce its recorded resolution; and if you turn the gain up, you may risk clipping your recording. I also found that there was a limit to how loud I could drive some higher‑impedance headphones using the built‑in headphone amplifiers, although that was mainly a concern when recording single vocals/instruments using quite high levels of direct monitoring. If you choose to use software monitoring, you can get throughput latency down to a reasonable 12ms at the lowest buffer size, and I was able to achieve this on the review system without glitching. However, changing buffer‑size settings in both Reaper and Cubase often seemed to require a restart of the sequencer before the new setting was applied — something I've not come across before. The Lexicon Ionix U82S is a very nice little interface that provides a well‑judged hardware feature set, good sonics, common‑sense ergonomics, and a great bundled reverb plug‑in. If you're more interested in quality and usability than huge numbers of connections, there's a great deal to recommend it. If you like the Ionix concept, but need fewer inputs, then of course there are the U42S and U22, although the feature‑set reductions of the latter make it much less attractive for me — two headphone outputs is pretty important for most one‑room studios, and the S/PDIF I/O allows you to substitute the onboard preamps and converters with stand‑alone units at a later date if you wish. If you're after a higher I/O count and are happy to work with the small latency of DSP‑based monitoring in return for greater mixing flexibility, Focusrite have some strong performers at this end of the market, with the Saffire Pro range fielding realistic competitors to all the Ionix USB interfaces, assuming that you're able to interface via Firewire. USB 2.0 audio & MIDI Interface. 24‑bit digital recording and playback at sampling rates up to 96kHz. Compatible with Mac OS 10.4.9 or higher and 32‑bit Windows XP/Vista. Analogue inputs: eight mic/line preamps fed from rear‑panel balanced combi‑jack/XLRs, each with 58dB available gain via front‑panel control; first two preamps can accept instrument‑level signals via side‑access jack sockets; rear‑panel phantom power switches for each input pair, each with front‑panel status LED. Analogue outputs: two line‑level outputs on TRS jacks with front‑panel rotary level control. Headphone output: two side‑access headphone jack outputs with front‑panel level controls; headphone feed follows main outputs. Digital I/O: coaxial S/PDIF input and output. Metering: eight‑segment LED bar‑graph meter for all analogue inputs and outputs; status LEDs for all three hardware monitor‑mixer dynamics modules. Other I/O: MIDI In and Out; USB sockets; 12V DC mains inlet. Decent all‑rounder preamps from Dbx. Easy‑to‑use, zero‑latency, analogue monitor mixer. Good build quality and metering. Bundled software, including the lovely Pantheon II reverb plug‑in. You can't adjust the monitoring level of an input independently of its preamp gain. Rear‑panel phantom‑power switches may not be to everyone's taste. A simple audio and MIDI interface that is nonetheless slickly and intelligently designed. If you're after maximum sockets‑to‑price ratio, the U82S might seem a bit under-powered, but the Dbx analogue know‑how on the front end and the Lexicon reverb lurking in the software bundle still make it an impressive product on its own terms. Lexicon Ionix U82S £494.50; U42S £322; U22 £247.25. Prices include VAT. Lexicon Ionix U82S $849.95, U42S $549.95, U22 $399.95. lexicon +1 516 594 0300. Ionix ASIO‑USB Control Panel Software v2.8.31. Rain Recording Solstice O3 PC with AMD Phenom II X4 810 quad‑core 2.61GHz processor, 4GB DDR2 RAM, and Windows XP Pro with Service Pack 3 v3264..